Mexican food has a long history in the United States. Fellow journalist Gustavo Arellano, author of Taco USA: How Mexican Food Conquered America, traces it back to the days of the Alamo when the "chili queens" used to dish out their beany, beefy stew to vaqueros on the streets of San Antonio. Today, it rivals Chinese and Italian food as the most popular cuisine in the country. 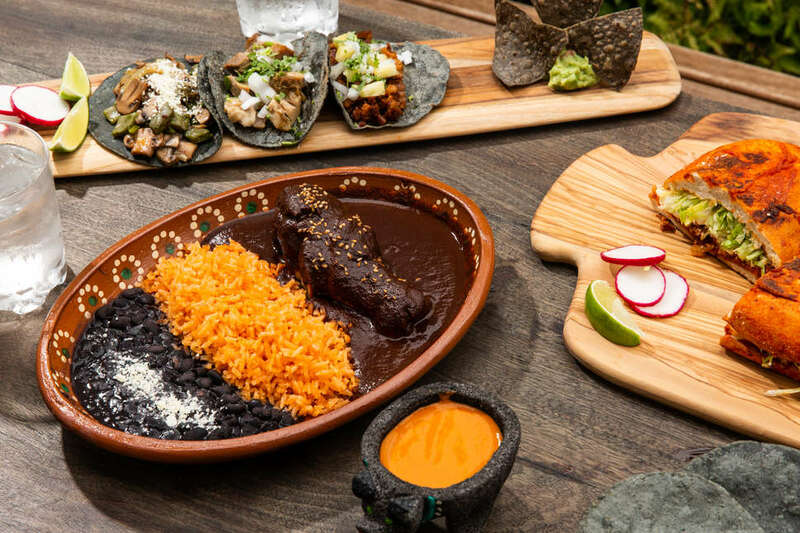 But when asked to pick a favorite dish, most people think of cheap tacos, Mission-style overstuffed burritos, or casual chains that dole out cheesy enchilada combos and margarita happy hour specials. But just as the shared border between Mexico and the United States is long, the varieties of food in the Mexican culinary cannon is deep. With this in mind, here are 13 Mexican dishes you might not be eating, but definitely should add to your list of favorites ASAP. Travel to Guadalajara in the Mexican state of Jalisco and you’ll find that birria reigns supreme. A spicy meat stew, usually prepared with goat that’s marinated in a spicy guajillo chili-based broth, birria street vendors are commonplace all over the region. Often served during weddings or other special occasions, birria is usually accompanied by bread or plated up in taco-form -- both great for sopping up that spicy, savory goodness. As far as hearty, restorative soups go, pozole is a deliciously fulfilling tradition. 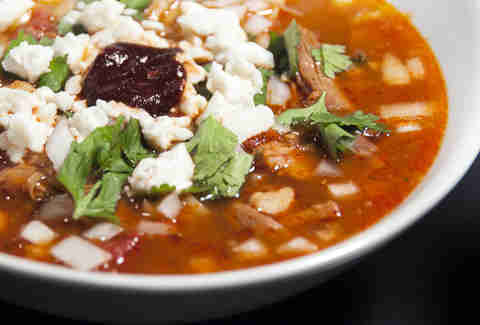 Made from hominy (a food made from dried maize kernels that are soaked and cooked in a process known as nixtamalization), this stew is prepared from a variety of sauces, including with a red chili base like guajillo or ancho; green with tomatillos, cilantro jalapeños or pipitas; or white -- without the use of either base. Typically garnished with diced onions, shredded cabbage, sliced radish, lime, and chili peppers, pozole is often made with pork, but increasingly can be found in vegan variations. The state of Puebla is widely regarded as one of Mexico’s culinary gems for its regional dishes, not often found in other parts of the country. 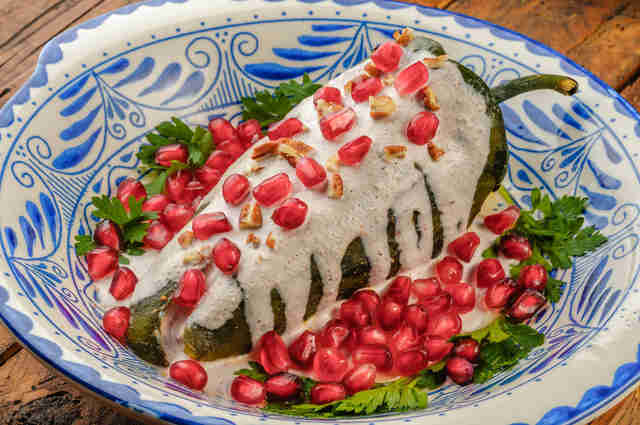 Among the state’s more treasured dishes is chiles en nogada, where a poblano chili is stuffed with a picadillo (shredded meat mixture with spices, fruit, and aromatics) and topped off with an airy walnut-based cream sauce known as nogada. The dish is an homage to the country’s independence in that its ingredients -- the green chili, white sauce, and red pomegranate seeds that are sprinkled on as a garnish represent -- the Mexican flag. The doriloco is the perfect hybrid of Mexican frutería and American junk food. Here, bags of nacho cheese Doritos are cut open lengthwise and are dressed up with chilis, crispy ribbons of jicama and carrots, squares of cucumber or even kernels of corn, japonés (soy-infused peanuts), lime juice, a drizzle of sweet-savory chamoy sauce, and sometimes gummy candies. Often sold by street vendors in Mexico and more and more in the United States, these mobile snacks are equally delicious and worthy of countless Instagrams. A pambazo is a Mexican white bread, the less crispy, drier cousin of the bolillo roll. But it’s also the name of the torta-esque snack that arrives stuffed with potatoes and chorizo and submerged in a spicy red guajillo sauce before being fried in oil and topped with crema, queso fresco, and shredded lettuce. Another Poblano innovation, the cemita is a celebration of deep-fried breaded meat. 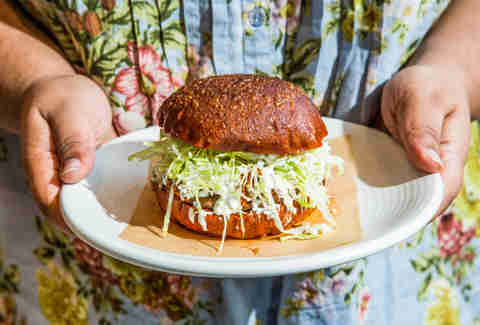 In the torta family, these sandwiches are made with a sesame seed-covered, brioche-like bread roll that’s filled with milanesa -- battered and fried cutlets of pork, beef, or chicken -- and then stacked with shredded queso, avocado, chipotle, and the fragrant Mexican herb pápalo. Be warned, however, that cemitas are not exactly the lightest of lunches and you might need a nap after. 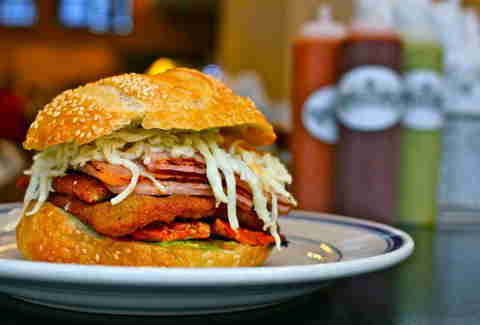 This "drowned" torta sandwich is a speciality of Guadalajara and features a marinated and fried pork filling. What sets it apart is that this sandwich is dunked in a vinegary tomato-based sauce that’s seasoned with chili de árbol, cumin, and other spices. 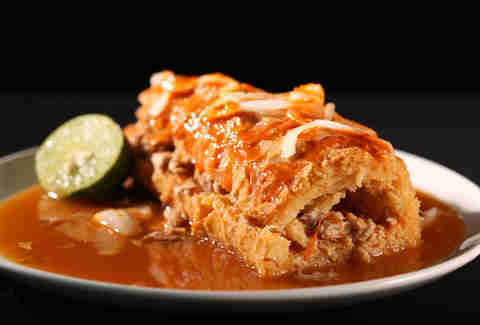 The crusty bolillo roll helps to soak up all the flavorful juices. The origins of chilaquiles -- made up of crisped tortilla strips tossed in either a red or green sauce -- came out of utility. Rather than throw out stale corn tortillas, they’re given new life when fried and mixed up into a sort of casserole. Dress the plate up with a sprinkling of queso fresco and crema and maybe top it off with a runny egg and it has the lasting, filling qualities needed to help make any day tolerable. Now with that primer on chilaquiles, you’re ready for the tecolota. Think of this as a breakfast sandwich, leveled up to incorporate all the things Mexicans love about breakfast. Particularly popular in Mexico City, the tecolota starts with a toasted bolillo roll, loaded with refried beans, followed by the chilaquiles, along with those cheesy, creaming fixings and a dash of cilantro and red onion for added crunch. The food scene in Oaxaca is red hot, thanks to its mashup of indigenous and Spanish settler traditions. In fact, its cuisine is one of the main draws to the region’s booming tourism industry. For a tasty antojito (snack), there’s the tlayuda, made up of a small, crunchy tortilla that can be folded or eaten open-faced with a schmear of refried beans, lard, some sort of pork like chorizo, beef or shredded chicken, stringy Oaxaca cheese, cabbage or lettuce, and a smidge of salsa. 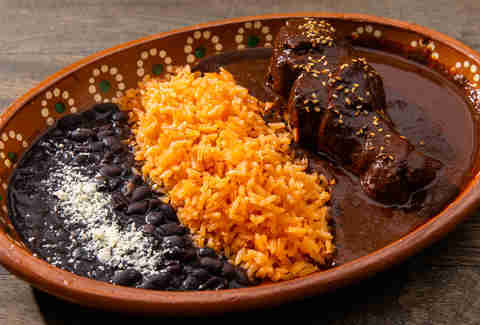 Mole is one of Mexico’s most treasured recipes, with variations ranging in color from yellow, to green, brown, black, and red. The flavor profiles are just as diverse: It can be sweet, spicy, bitter, chocolatey, or, more likely, a combination of tastes. Depending on the maker of the recipe, mole can take upward of two weeks to prepare, with some heirloom recipes calling for upwards of 32 ingredients. The best varieties are ones where all of these components work in harmony, with no single one flavor overbearing the other. Among the more common ingredients are Mexican chocolate discs, raisins, pumpkin and sesame seeds, peanuts, almonds, plantains, and animal crackers. Usually served atop some sort of poultry or as a base for enchiladas, the intricacy of the recipes means mole is perfect for celebrations. Another word that derives from the Nahuatl language, chapulines are grasshoppers and are commonly eaten in parts of Mexico. 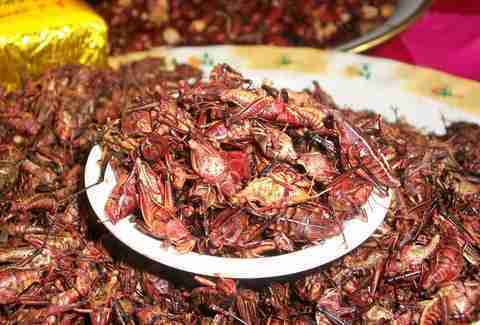 In more recent years chapulines have been touted as one of the most sustainable food sources in the world, though they have been a staple in southern Mexico for centuries. They are often dried and toasted and flavored with lime juice, garlic, and sometimes chili, making for a protein-rich, low-fat, savory, earthy, and crunchy snack, not unlike a bowl of dried shrimp. They can be eaten alone such as at sporting events, but chapulines are also often sprinkled into tacos, tostadas, and even pizza, as demonstrated at a new restaurant in Detroit. Mexicans and Middle Easterners have long held a culinary connection, dating back to the days when Lebanese immigrants introduced shawarma spits (known as a "trompo" in Spanish) to Mexico. One distinct dish that showcases this connection is the taco árabes, utilizing flavorful slices of pork from a spit and stuffing it into a pillowy, pita-like tortilla. One major distinction, instead of being stuffed into a thin, more pliable corn tortilla, taco árabes are make with a thicker, almost pita-like bread. Do not mistake this for the more familiar taco al pastor, which is loosely translated to “shepherd-style” pork. The meat is marinated in a blend of chilies, spices, and flecks of pineapple and then slow-cooked on that trompo using an open flame. Serena Maria Daniels is writing & reporting at the intersection of halal burgers, Ramadan IHOP, grasshopper pizza, taco literacy & urbanism. She is a recovering daily newspaper reporter and the Chingona-in-Chief at Tostada Magazine.